The covered front entrance features a door flanked by wide sidelights. WILTON — Mundane, pedestrian, commonplace, average, run-of-the-mill, ordinary, typical, uninspired. All of these words were once appropriate when applied to the cream-colored colonial at 48 Range Road when it was first built in 1954. Since then, the house was expanded and improved. So get out the dictionary or thesaurus because now it would take a bunch of antonyms to accurately describe this house, which sits in a convenient South Wilton location. After the improvements made by the current owners, the words that are more fitting for this house include distinguished, eye-catching, remarkable and wondrous. The current owners, who have lived there since 1975, hired Clark Construction of Ridgefield to make alterations to the exterior facade, expand the footprint to 2,059 square feet of living space, add a new kitchen, and make improvements to the second floor. The project also included the installation of a patio and the addition of a large screened porch, which features a fireplace. More recently the couple engaged the creative services of Fairfield interior designer Laura Robinson, who imbued the updated house with neutral colors and a calming, harmonious atmosphere. 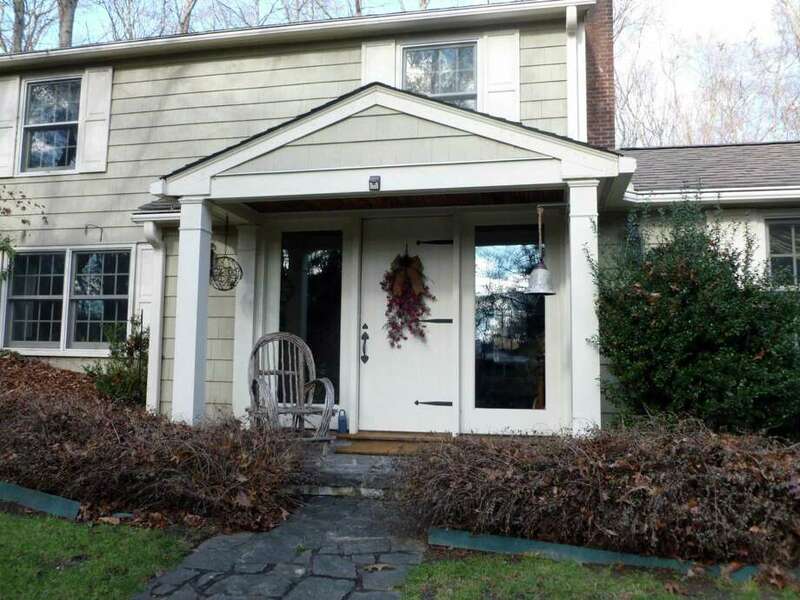 This house was built on a 1.5-acre level and gently sloping property in a wooded setting, and it is set behind a gate well back from the road giving it ample privacy and yet it is in a very convenient location only minutes from shops and eateries in Wilton center, the train station and Route 7. There is a long circular driveway that travels passed man-made stone walls and natural outcroppings of large boulders. The detached barn-like two-car garage has stairs to a loft space. It is topped by a cupola and rooster weather vane. A stone path leads to the covered front entrance where the door is flanked by wide sidelights. The door opens into the foyer and front-to-back formal living room, which has a fireplace against a brick wall painted white. To the left is the family room with random width hardwood flooring. This room provides access to the laundry room and a half bath. To the right is the formal dining room with a built-in corner china cabinet, chair railing, and exposed beams. It is open to the gourmet kitchen featuring a fireplace, a center island with a breakfast bar and Pietro Cardoza counter, granite perimeter counters, custom cabinets, and a farm sink. High-end appliances include a Sub-Zero refrigerator, Viking Professional four-burner range with griddle, and a Miele built-in coffee maker. There is also a door to the side yard by the garage and its attached shed. On the second floor there are three bedrooms. The spacious master suite features a walk-in closet with organizers, a built-in corner armoire, and an updated master bathroom with a stone floor and beveled edge vanity. A multiple glass-paned door leads out to the three-season sun room, which has a sizable fireplace, cathedral ceiling of wood, and a ceiling fan. It provides an attractive place to sit and relax and watch the seasons unfold year round. Although the master is on the second floor the topography of the property allows two doors on opposite walls in the sun room to access the yard. The other two bedrooms share a hall bath. For more information or to make an appointment to see the house contact Shelley Shapiro of William Pitt Sotheby's International Realty at 203-451-0873 or sshapiro@williampitt.com.